This lesson is taken from the passage where Wise men from the east follow a star seeking the King of the Jews. They seek help from Herod in Jerusalem and travel to Bethlehem to worship Jesus and give Him gifts. Both the Magi and Joseph are given dreams to keep them safe from Herod’s anger. It can be used for upper elementary and simplified for preschool age children. Following the lesson there are additional resources to use for your individual class’s needs. The best gift we can give Jesus is our worship and obedience. True faith in Jesus hears and obeys God’s Word. God keeps those who trust in Him safe from their enemies. Activity for teaching the verse: Pictures or objects that represent the following: Bible, Preacher, teacher, radio, TV, picture of creation, devotional magazine, Christian book and friend. Place items in a pillow case or bag. Read the verse along with the students. Ask, “Who is the ‘me’ in this verse?” Allow students to respond and answer that it is God. God has given us many ways to know about Him. In this bag there are objects that God uses to attract people to Himself. (Allow a student to come and take an object out of the bag.) Discuss the object and ask the students how God can use that object/picture to attract people to Himself? (Radio: Christian music, teachings from the Bible. TV: Preachers, movies, shows that teach about Jesus. Friend: Shares the Gospel with you. Creation: Makes us think about the Creator. (Romans 1:20) After each object has been discussed move into the Bible Lesson. Note: This is just a guide to prepare you for your class. Pray and keep your students and the needs they may have in mind as you prepare. (Some students have had little or no exposure to the Bible, where some students have a strong working knowledge of many of the truths taught in the Bible. Our class consists of students raised in Christian homes, attend Christian school, and homeschooled. They have a strong working knowledge of the Bible so our goal is to give them deeper truths praying for them to desire to love God’s Word and find it exciting and new each time they learn from it. Adapt this lesson to the understanding level of your students.) God is faithful to give you exactly what you need as you faithfully present His Word to your class each time you teach. Before class preparation: If you would like students to read additional verses have them written out and prepared in advance so you can ask them as they come into classroom. They can find the verse ahead of time and place the slip of paper in the place in their Bible to be ready when you need them to read. Provide Bibles for students who do not have or did not bring to class. We encourage our students to have a Bible because we want them to be engaged in the Bible teaching time. If the teacher asks for someone to read a particular verse the students will have their own Bible open to the passage enabling them to volunteer to read if they choose. Let’s turn in our Bibles to Matthew 2. Allow students to find their place and place a marker there. If any students are having a difficult time encourage those who have found their place to help their friend closest to them find their place. In our story today we will see people who wanted to have Jesus as King of their heart and those who did not. Let’s get into our story today so we can find out who these people are. When Daniel lived in Babylon Nebuchadnezzar had many men in his kingdom who were called wise men. Daniel, a Jewish young man was the wisest of all in Nebuchadnezzar’s kingdom. He was wise because he trusted and obeyed the One True God and didn’t worship pretend gods. Today our story begins in the area where Babylon used to exist. Hundreds of years have past since Daniel lived in Nebuchadnezzar’s kingdom. In this land the people still had many wise men. These men were also called Magi. Magi were like priests to the king. The king would call for them when they needed to know something. Magi were wise in many things. One of the things these men studied was stars. These men knew a lot about the stars and their locations in the sky. We call people who study stars astrologers. One night as these wise men looked out at the stars they saw a star that they had never seen before. It was amazing to these wise men. They began to read books and find out what they could learn about this star that seemed to miraculously appear in the sky. As they looked through their books maybe they came across some notes that people had written many years ago. These notes may have been written during the time when Daniel was living. Maybe they read a prophecy from Numbers 24:17 that says: “A star will come out of Jacob; a scepter will rise out of Israel.” Somehow the wise men learned that a Ruler was going to come out of the land of Jerusalem. This King would be a special king because the One True God had promised to send this King. Because the star was so spectacular and they knew that it had been shown to them. They wanted to find this King that this Star was pointing them to. They wanted to find this King and worship Him. These men set out to seek the King of the Jews. These men knew that they could find out more about this King if they traveled to the land of Jerusalem to learn of Him. They knew that the Jewish people lived in Jerusalem. They traveled there because they thought they might find all the people of Jerusalem worshiping the King God had sent. We don’t know how many of these wise men packed up their things and began the long journey to find the King. Many times we think it is three because of the song We Three Kings and also because they gave 3 gifts. It is possible that it was a large number of wise men that traveled to Jerusalem. We also always imagine them riding on camels. The Bible doesn’t tell us what they rode. It is very possible that they rode horses. We do not know for certain because it is not recorded in Scripture. As these wise men are traveling the long trip to Jerusalem, let me tell you about the man who is ruling in the land of Jerusalem. His name is King Herod. He is a very troubled man. He was known as a wicked and cruel King. As time passed he became very suspicious of anyone trying to take away his crown and he would not be the king anymore. History tells us that whenever he became suspicious of anyone he would have them put to death. We don’t know this for sure but let’s imagine this is what might have happened. One day as Herod sat in his palace his servants came and told him that there was a large group of men coming into Jerusalem. King Herod must have wondered why this group of men was visiting him. Maybe he thought they came to admire his great kingdom and speak with him about his greatness. It must have been surprising to the Magi that when they arrived in Jerusalem the city was not filled with people who had great joy and excitement on their faces because they had received the King of the Jews as their God had promised. What they must have seen was a city filled with people going about their day like they would on any ordinary day. King Herod thought he was pretty important. From what the wise men were saying it didn’t sound like they were coming to look for him. He was a little startled by their question. The Jewish people were looking for the Promised King to come and rescue them and be their King. If this King came what would happen to Herod, would he still be king or would he lose his crown? He was very troubled by the news the wise men brought and the news began to trouble the people living in Jerusalem. King Herod gathered the chief priests and scribes who knew God’s Word. He asked them where the Christ was to be born. The scribes told him that it was written in God’s Word that the Christ Child would be born in Bethlehem. Do you think King Herod was seeking the King of the Jews? (Allow students to respond.) If King Herod or any of the Jewish people were truly seeking the King of the Jews wouldn’t they have packed up and traveled with the Magi to worship the King too? Listen to this verse: (Have volunteer read Psalm 10:4 “In his pride the wicked doesn’t seek Him; in all his thoughts there is no room for God.”) This verse is a perfect verse to describe Herod and most of Jerusalem. God had kept His promise and sent Jesus the King of the Jews. Instead of being the first to go and find Him to worship Him, Magi (men who were not Jewish) were seeking the King. The wise men left Jerusalem knowing that Bethlehem was the destination of the Christ Child. They must have been getting so excited about seeing this King. With the many houses where the King might be, the Magi wouldn’t know which house to look first. God knew these wise men were truly seeking Him. He guided them to the place where the King could be found. God allowed the star that led them to shine brightly over the home where He was staying. The wise men knocked at the door and inside this little home they found a husband and a wife. As they came to the door they held a young child about 2 years old in their arms. Mary set the Child down and the wise men bowed to the ground and worshiped the King. They brought treasures to give to the King. These were expensive gifts that the men had brought. They brought Gold, Frankincense and myrrh. Gold is a gift that is given to kings. Frankincense is a gift that represents that the person receiving it is God. Myrrh is a spice used for wrapping a body that has died. All of these gifts were symbols of who Jesus is. Jesus is the King. He is God and when He grew up He would die for all our sins and would be raised to life again. He returned to heaven and one day He would come back as King of Kings. As soon as the wise men finished worshiping the King, they left and began to travel back to Jerusalem to tell Herod where the King was. They needed rest before they could begin this long journey home. As they slept the Lord spoke to them in a dream and warned them not to go back to Herod. They heard and obeyed God’s voice and went back to their land a different way than through Jerusalem. God kept the Magi safe from Herod. Imagine what Mary and Joseph felt like after the wise men visited them. These wise men had come to worship the Promised King and had given Him expensive gifts as they worshiped Him. At night as Joseph was sleeping, God spoke to him in a dream. He warned him that he had to take Mary and Jesus to Egypt quickly so that He would be safe from King Herod. God told Joseph to stay in Egypt until Herod dies. Joseph heard and obeyed God’s voice and took his family to Egypt just as God told him to. Joseph trusted God and God kept his entire family including the Child Jesus safe from harm. Because Herod’s heart was full of pride and foolishness he actually thought he could get rid of God’s promised King. He commanded his soldiers go throughout the land of Bethlehem and surrounding areas. They were to put to death all children who were two years old and under. God always keeps His Word. Nothing can stop God’s plans. Many years before Herod was even born, God knew that Herod would do this terrible thing to all the baby boys. Even though Herod was wicked and tried to kill the Promised King, God kept Jesus safe by sending Joseph to Egypt until Herod was dead. When Herod died God told Joseph it was safe to return to the land of Israel. Joseph took Jesus and Mary and they lived in the city of Nazareth. God sent the King of the Jews, Jesus into the world so many years ago. God spoke to people and showed them the way to His Son. He spoke to the shepherds by sending an angel and they went and found Jesus and worshiped Him. God sent a star to lead the wise men to the King of kings and they worshiped Him. Herod learned about God’s King but he was so worried that Jesus was going to take away his kingdom that he tried to have Him killed. Jesus didn’t want Herod’s throne He wanted his heart. We never read of Herod ever bowing to worship the King of all kings. Every one of us here this morning has been shown the King. God has allowed us to hear from His Word, His promises to send a King and how He kept His promise. Jesus came to this earth as a baby, grew up and died on the cross so we all could be saved. He is the King and one day He will come back to this earth and rule as the King of all the earth. What will you do with this information God has given you? Will you believe in Jesus? Will you bring your best gift to Jesus and worship and obey Him? Will you worry that Jesus will not allow you to do the things you want to do and you will try to be your own king? It is our prayer that you will choose to believe in Jesus and allow Him to be the King of your heart. God kept His promise to send the King of the Jews. The Magi were truly wise men because they heard about this promise and followed the star that God sent to guide them to Jesus. The Jewish people living in Jerusalem were not wise because although they had the Scriptures that taught them God’s promises they didn’t have room in their heart to do anything about it when they heard the news from the Magi. God made a promise that has not happened yet. He promised that one day Jesus is going to return and punish those who reject Him and reign as King of all the earth with those who believe in Him living in His Kingdom. How do we live knowing that promise? If a person who was not a believer in Christ were to ask you about Jesus coming back would you know what to say? Do you know what the Bible says so you could share with them? Is your life an example to that person that you believe Jesus is coming again? Are behaving in a way that shows you are expecting Jesus to return? If not, what changes do you need to make so that you can be ready at any moment for Jesus to come back? Why did the wise men travel to Jerusalem? Where did the scribes tell Herod the Christ Child would be born? How did God lead the wise men to the King? 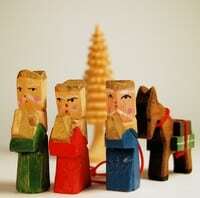 Why did the wise men go a different way back home? How did Herod act when the wise men didn’t come tell him where the Baby was? How did God protect His Son? Where did Joseph take his family to live after Herod died? Which group of people was seeking God? Which group of people was not seeking God? How does God lead people to Jesus today? How can you allow Jesus to be the King of your heart? Need More Help? Then check out our Wise Men lesson for Children’s church, a children’s sermon about the Magi, a preschool song about the Wise Men, or this lesson about King Herod. Wait there’s more . . . You can browse all of our printable Christmas Lessons and coloring pages. Our free materials are perfect to use in your church, home, or school. There is no charge and you are welcome to copy as many as you like.